I wasn’t sure what mythological topic to cover today, so I turned to the Muses for inspiration. Fame whores that those girls are, they suggested that I write a post on them. So, here are the nine Muses, dwellers on Mount Helicon who inspire artists and scientists. The idea that there are nine is actually a relatively late one, with earlier myths referring to lower numbers of Muses. They are usually identified as the daughters of Zeus and Mnemosyne, the Titaness of Memory. 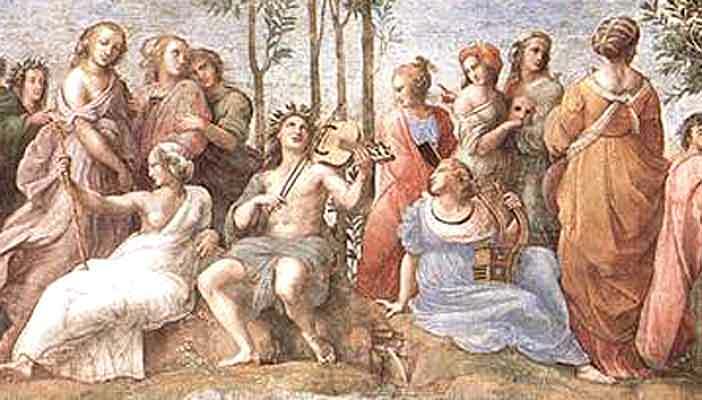 In the late Hellenistic period, each girl came to be associated with a different art: Calliope with epic poetry and song, Clio with history, Euterpe with lyric poetry, Erato with love poetry, Melpomene with tragedy, Thalia with comedy, Terpsichore with dance, Polyhymnia with sacred poetry, and Urania with astronomy. (For what it’s worth, Calliope and Terpsichore are usually the only two I remember without looking at a list.) As they play an inspirational role, authors tended to invoke them at the beginnings of their work. Some myths refer to Apollo as the leader of the Muses, as he is known as the god of music. I’m trying to think of more modern appearances of the Muses, but the only one that really comes to mind is the Xanth series, in which the nine sisters live on Mount Parnassus (named after the Greek mountain that is sometimes said to be their home, although I get the impression that Helicon is more commonly used in that capacity). Clio is especially important, being the true author of the histories of Xanth that make it to Mundania, and playing a starring role in Currant Events. I also remember a mention of the Muses in Terry Pratchett’s Soul Music, although they never actually appeared. On the Discworld, they apparently number only eight (that world’s most magical number), and characters refer to their leader as “Cantaloupe.” Some of the Muses appear in Disney’s Hercules, in which they sing gospel music. This entry was posted in Discworld, Greek Mythology, Mythology, Terry Pratchett and tagged apollo, calliope, clio, currant events, disney, erato, euterpe, hercules, melpomene, mnemosyne, mount helicon, mount parnassus, muses, piers anthony, polyhymnia, soul music, terpsichore, thalia, urania, xanth, zeus. Bookmark the permalink. What about the movie Xanadu? It has a muse theme. It’s even a little a-muse-ing, in a cheesy way. Plus, I’d watch Gene Kelly watch paint dry. I’ve never seen that movie, but thanks for the reference! I also came across this Wikipedia page, which lists other modern references. I know originally there were only three Muses, who inspired oration, eloquence, and memory–so more the goddesses of public speech than the arts and sciences. Don’t forget, the temples dedicated to the Muses were called museums, which of course gave rise to today’s “temples” of the arts and sciences. I know the Field Museum of Natural History in Chicago has statues of the Muses situated in the main hall, at the second floor level. And that’s the gospel truth!